Collection of prayers, by David Franco Mendes. קול תפלה וקול זמרה / נשמע בית ה‘ בית תפלתנו פה העיר / אמשטירדם / בק″ק הספרדים מאז באו אבותינו מפורטו גאל ואיספאניה עד היום / אנכי הכותב חפשי. 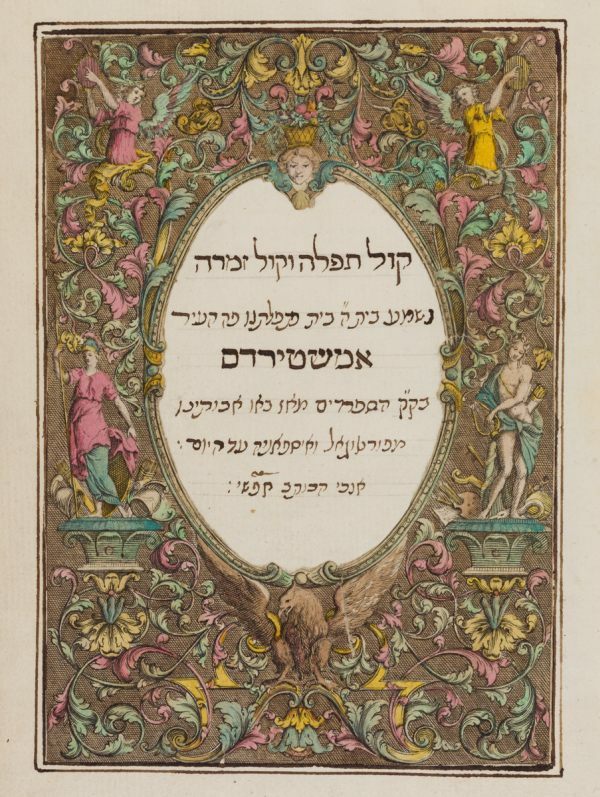 Collection of prayers for several occasions, recited in the Sephardic synagogue of Amsterdam in the years 1608-1788, collected and copied by David Franco Mendes. Amsterdam, 1788.
p. 1: Hebrew poem copied from Neve Shalom synagogue’s board, 1608.
p. 2-4: Bacasâ by Haham Joseph Pardo, rabbi of Beth Jacob synagogue. Text in Hebrew. p. 4: Quinah by Haham Isaac Uziel, rabbi of Neve Shalom synagogue. Text in Hebrew. p. 5: Nehamah by Hazzan Joseph Salom b. Salom Gallego from Beth Jacob synagogue. Text in Hebrew. p. 5-6: Pizmon of praise to the three Quehilot, by Hazzan Joseph Salom b. Salom Gallego. Text in Hebrew with annotations in Portuguese. p. 6-7: Pizmon of praise to the charity brotherhoods of the congregations, by Hazzan Joseph Salom b. Salom Gallego. Text in Hebrew with annotations in Portuguese. p. 7-8: Pizmon of praise to the brotherhood for vestiaria of Talmidim, by Hazzan Joseph Salom b. Salom Gallego. Text in Hebrew with annotations in Portuguese. p. 8-9: Pizmon of praise to Beth Jacob synagogue, sung at the second night of Pesach until Shavuot, by Hazzan Joseph Salom b. Salom Gallego. Text in Hebrew. p. 9-10: Pizmonim for the scrolling of Sefarim at Simhat Torah and the inauguration of a new Sefer Torah, by Hazzan Joseph Salom b. Salom Gallego. Text in Hebrew. p. 11-15: Congratulations from Haham Menasseh ben Israel to Frederik Hendrik of Orange for his visit to the Talmud Torah synagogue, 1642. Text in Hebrew. p. 15: Hebrew prayer recited in the Beth Jacob synagogue at Tisha b’Av, 1604.
p. 16-19: Hebrew poem by Haham Isaac Aboab da Fonseca at the inauguration of the Portuguese synagogue of Amsterdam, 1675.
p. 19: Hebrew poem by Selomoh de Oliveira at the inauguration of the Portuguese synagogue of Amsterdam, 1675.
p. 20: Hebrew poem by Selomoh de Oliveira at Simhat Torah. p. 21-23: Oração que disse este KK.s em 4.ª Feira, 27 Outt.ro 1688, Partindo a Arm.da Naval dos Est.s Gerais destas Provincias, de 635 Velas, com 21 m.l homens, para Inglaterra, comand. p.r nosso Stadhoud.r Guill.mo 3.ro... Prayer recited on 27 October 1688, at the occasion of the departure of the Dutch army for the campaign in England against Louis XIV’s troops. Text in Hebrew with exhortation and title in Portuguese. p. 24-27: Oração que disse este KK.s em 26 Julho 1690, dia instituído plos Estad.s Gerais das Prov.s Unidas p.ª dar Graças a D.s pelos Triumphos q. Concedeo a Nossa Armada en Irlanda, comandada p.r Guill.mo III…. Prayer to give thanks for the victory of William III in Ireland, recited on 26 July 1690. Text in Hebrew with exhortation and title in Portuguese. p. 28-30: Oração que disse este KK.s em [blank] Dezembro A.º 1697, Dia que instituirão os Estados para dar graças a D.s plas Pazes que se concluirão em 20 Sett.ro d.º Anno em Ryswyk. Prayer to give thanks for the peace-settlement of Ryswyk, recited in December of 1697. Text in Hebrew and title in Portuguese. p. 31-35: Oração que disse este KK.s em 13 de Junho A.º 1713, dia instituído p.los Estad.s destas Provincias p.ª louvar & render graças a D.s pla Paz que estabecerão, em 11 Abril dito Anno, com a França no congresso de Utrecht. Prayer to give thanks for the peace-settlement of Utrecht, recited on 13 June 1713. Text in Hebrew with an exhortation and title in Portuguese. p. 36: Hebrew poem by Haham Selomoh de Meza, recited at Simhat Torah, 5479.
p. 37-51: Oração que disse este KK.s em 2ª & 5ª feira de 23 Tisri 5488 te 1º Nissan dito Anno, na Epidemia da Terçans…. Prayer to avert a disease that had spread through the country, recited between 23 Tisri and 1 Nisan 5488 (1727). Printed text in Hebrew and handwritten title in Portuguese. p. 52: Hebrew poem recited by Aaron Cohen de Lara when he became Hazzan, 1728.
p. 54-66: Oração que disse este KK.s a 2.ª & 5.ª Feira de 18 Hesvan te 28 de Tebet A.º 5493 para implorar de D.s nos livrasse dos bichos que rohião os mastos e palissadas que sostem os diques que circundão e defendem de innundações as nossas Provincias. Prayer to avert a plague of insects that was destroying the fences that supported the dikes, recited between 18 Heshvan and 28 Teveth 5498 (1732). Printed text in Hebrew with an exhortation in Portuguese. Handwritten title in Portuguese. p. 67: Pizmon of Le’el Elim, 1739. Text in Hebrew. p. 68-69: Hebrew poems recited by the candidates for the position of Hazzan when Hazzan Semuel Rodrigues Mendes died, 1783.
p. 69-70: Hebrew poems recited at the admission of Joseph de Isaac Sarfati for Adjunct Hazzan. p. 70: Hebrew poems recited at the admission of Joseph Gomes Silva for Hazzan. p. 71: Hebrew poem by Hazzan Joseph Gomes Silva, recited at Simhat Torah. p. 71: Hebrew poem by Hazzan Joseph Gomes Silva, recited at Shabbat Nahamu. p. 72-77: Orações que disse este KK.s a 4.ª Feira Tarde no A.º 5507 quando padecião estes Estados as Ostelidades da França te a tomada de nossa fronteira Bergen op Zoom A.º Vulgar 1747. Composta plos Eminentissm.s HH.m Israel Athias & Abendana de Britto. Prayers composed by Hahamim David Israel Athias and Isaac Abendana de Britto during the conflict with France, 5507 (1747). Printed text in Hebrew with exhortation in Portuguese. Handwritten title in Portuguese. p. 76-77: Prayer for the safe delivery of the Princess of Orange, 1747. Text in Portuguese and Hebrew. p. 78-79: Festiva Celebração deste KK.s no alegre dia de 22 Sivan 5507 & 5 Mayo A.º 1747, dia da Proclamação de S. A. Sereníss.ma Guill.mo Carlos Hen.que Frizo Principe de Orange & Nassau & & &.ca por Stad Houder… . Celebration for the proclamation of William IV Stadtholder of the United Provinces on 22 Sivan 5507 (5 May 1747). Text in Portuguese with a prayer in Hebrew. p. 80-83: Oração que disse nosso KK.s em dia de 25 de Sivan Anno 5509 & 11 Junio 1749, Dia de Orações desta Província para rendim.to de Graças a D.s p.r haverem cessado as Ostelidad.s da França... Prayer to give thanks for the establishment of peace with France, recited on 25 Sivan 5509 (11 June 1749). Text in Hebrew, with title and final annotation in Portuguese. p. 84-91: Oração que disse este KK.s em 17 Adar prim.ro A.º 5516, dia de Jejum & Pregarias instituido plos Estados nestas Provincias p.ª Implorar nos escape & perserve de Terremotos que experimentarão as terras vezinhas, as nossas, & particularmente a de Lixboa em primeyro Nov.º A.º 1755. Prayer to avert earthquakes, recited on 17 Adar 5516 (7 February 1756). Printed text in Hebrew, with an exhortation in Portuguese. Handwritten title in Portuguese. p. 93-94: Quinah recited on the death of Haham Isaac Abendana de Brito, 1760. Text in Hebrew. p. 94: Hebrew poem recited for the admission of Haham M. V. Salem, 1761.
p. 95: Festiva Celebração deste KK.s no alegre dia de 27 Adar 5526 & 8 M.ço 1766, dia da proclamação de S. A. Sereniss.ma Guillelmo 5º… Celebration for the proclamation of William V Stadtholder of the United Provinces, on 27 Adar 5526 (8 March 1766). Text in Portuguese. p. 96-98: Oração que disse nosso KK.s no dia de 13 Novem.ro 1767, dia de Celebração do Cazamento de Nosso Sereniss.mo Principe Guilhelmo 5º… Prayer by Haham M. V. Salem for the celebration of William V’s marriage, recited on 13 November 1767. Text in Hebrew with title and exhortation in Portuguese. p. 99-103: Celebration for the visit of William V to the Portuguese synagogue of Amsterdam, 1768. Text in Hebrew with an exhortation in Portuguese. p. 104-106: Oração que principiou a dizer este KK.s em noute de Sabat 7 Tebet A.º 5529 & 17 Dez.ro 1768 para pedir a D.s concedesse felise delivramento a S. A. Royal a Sereniss.ma Princeza Sophia Fred.ca Willemina & se prossegio te 15 Adar 2.do d.º A.º. Composta pelo Sr. nosso Haham. Prayer for the safe delivery of the Princess Frederika Sophia Wilhelmina, composed by Haham M. V. Salem and recited between 7 Tebet and 15 Adar 5529 (17 December 1768 – 11 February 1769). Text in Hebrew and title in Portuguese. p. 107-108: Oração que principiou a dizer nosso KK.s Sabat a noute, de pla manha & tarde em 25: Adar 5529 & 4 Março 1769, & o mesmo 2.ª & 5.ª fra antes de Sepher, p.ª Implorar a D.ª Clemencia, cessem já as doenças & mortandade do bestiambre nestas províncias. Composta plo. Sr. nosso HH.m M. V. Salem… Prayer for the end of a plague, composed by Haham M. V. Salem. 1769. Text in Hebrew and title in Portuguese. p. 109: Poem composed for the admission of Aron de David Hamis Vaz as Adjunct Hazzan on 25 Heshvan 5532 (22 October 1771). Text in Hebrew with introduction in Portuguese. p. 110-111: Oração que disse nosso KK.s para implorar da D.ª Magestade o felisse delivramento de S. A. R.l a Serenissima Princeza Sophia Frederica Willemina em Jejum de Ester 5532, 1772: Composta plo Sr. nosso Haham M. V. Salem… Prayer for the safe delivery of the Princess Frederika Sophia Wilhelmina, composed by the Haham M. V. Salem and recited at the Fast of Esther in 5532 (1772). Text in Hebrew and title in Portuguese. p. 112-114: Hebrew poems recited by the candidates for the position of Hazzan when Hazzan Joseph de Isaac Sarfati died, 1772.
p. 114-115: Hebrew poems recited on the admission of David de Imanuel da Silva for Hazzan. p. 116-117: Hebrew poem by the Hazzan David de Imanuel da Silva recited at Simhat Torah. p. 117: Portuguese annotation about a prayer recited on 3 October 1773 for the safe delivery of the Princess Frederika Sophia Wilhelmina. p. 118: Quinah on the death of the Haham Hisq. Selomoh Salem, 1781. Text in Hebrew. p. 118: Hebrew poem recited on the admission of Aron Hamis Vaz for Hazzan, 25 January 1782.
p. 119: Hebrew poem for the election of the Haham M. V. Cohen d’Azevedo. p. 120-124: Orações que disse este KK.s nos Maundelyke Beedestonden que instituirão nosso Soberanos os Nobr.s Grand.s & Poder.s Estados, p.ª implorar o triumpho de nossas Armadas & Aliad.s contra as da Gran Bretanha que lhes declarou a Guerra e se principiarão a dizer em 4ª fr.ª 5 Junho 1782 & se continuou té R: Nissan 1783. Prayer for the victory of the Dutch army against the British troops, recited between June of 1782 and Nisan of 1783. Printed text in Hebrew and handwritten title in Portuguese. p. 124-125: Oração Composta p.lo Eminentiss.mo S.r Nosso HH.m M: V: Acohen de Azevedo q. Ds g.de e pronunciou o Hazan David de Im.l da Silva em Sabat a noite 28 Fev.ro 1784 em rendimento de graças aos Nobres e Veneraveis Senhores Burgamestres e Magistrado desta cidade… . Prayer to give thanks to the burgomasters and magistrates of Amsterdam for the application of a general collection to help the poor of the city during the rigourous winter of that year, composed by Haham M. V. Cohen d’Azevedo and recited by Hazzan David de Imanuel da Silva on 28 February 1784. Text in Hebrew and title in Portuguese. p. 125: Hebrew poem for the Shabbat Nachamu. p. 127-128: Oração que proferiu o Haz. Dav: de Imanuel da Silva Sabat a noite 7 Quislev A 5548… para recuperar os dispendios extras da Sedaca feitos nas tribulações d’esta cid.e…. Prayer recited by Hazzan David de Imanuel da Silva on 7 Kislev 5548 (16 November 1787) concerning the tribulations which had devastated Amsterdam. Text in Hebrew and title in Portuguese. p. 129-131: Celebração Do Nosso KK.s aos 7 ag.to 1788 (Sebem 3 de Ab) por ser dia do aniversario de Sua Alteza Real a Sereniss.ma Princeza Frederica Sophia Willemina... Celebration for the birthday of the princess Frederika Sophia Wilhelmina on 7 August 1788. Text in Hebrew and title in Portuguese. p. 133: Oração em 28 de Menachem A.º 5546 em Sabat a Noite. Publicou o MM.d ao KK.s a Magnanimidade de nosso Amado Principe & Stad Houder Guillermo 5º… Prayer to give thanks to William V for his magnitude with the Sephardic congregation of Amsterdam, composed by Haham M. V. Cohen d’Azevedo and recited by Hazzan David de Imanuel da Silva. Text in Hebrew and title in Portuguese. p. 133-134: Memoria dos Emperadores, Reyes, Principes & Nobres Varoens que vierão ver nossa esnoga. Memory on the emperors, kings, princes and nobles who visited the Portuguese synagogue of Amsterdam between 1642 and 1786. Text in Portuguese. Hebrew and Portuguese / Paper / 19,2 x 11,9 cm / 142 +  pp. (first and last ll. Blank) / Sq. and Sephardic cursive and current writing / Title written in engraved ornamental frame pasted upon the p. and coloured by hand / Text written in frame of 13,2 x 8,8 cm. Ruled in red ink / Contemporany gold-tooled leather binding. Pages 32-50, 55-69, 73-76, 85-90, 114, 118, 121-129 contain printed text, pages 51, 52, 102, 103v, 114v are blank, the last 11 ff. contain an index. Text in Hebrew with some parts in Portuguese / Paper / 19,2 x 11,9 cm. / 142 +  pp. (first and last 4 ll. blank) / Square and Sephardic cursive and current writing / Title written in engraved ornamental frame pasted upon the page and coloured by hand / Text written in frame of 13,2 x 8,8 cm., ruled in red ink. / Contemporary gold-tooled leather binding. Fuks 97. Fundação Calouste Gulbenkian.